White Night is scheduled to turn Melbourne and Ballarat aglow again this February, and the program is looking all sorts of awesome. It’s safe to say, these cities are about to get LIT. Melbourne’s White Night theme this year is ‘What if?’ As in...‘What if we created a huge 3D video-mapping installation on the REB building?’ Or ‘What if we get Serpent Mother from Nevada’s Burning Man to light up the State Library with a giant flaming kinetic sculpture?’ These are the big questions. 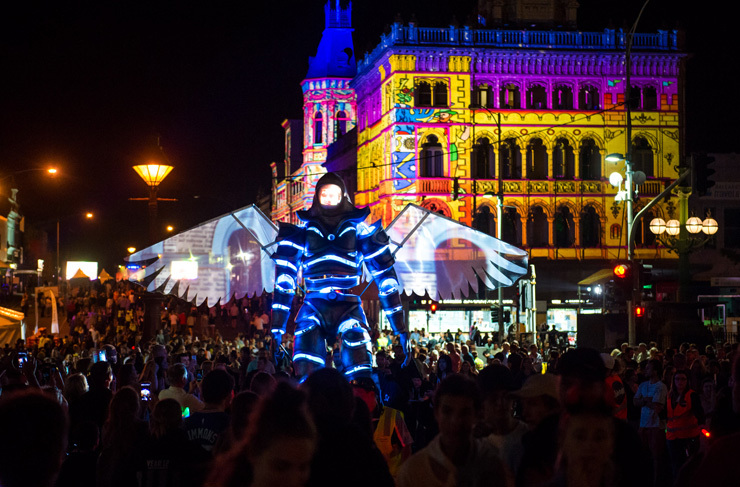 The giant, 5-metre White Night Messenger will be back again (you might remember it from last year), and there are plans underway to turn Little Bourke Street into a non-stop, 12-hour outdoor music marathon, complete with falling snow. Flinders Lane is even paying homage to our favourite female icons with a two-state animation, FEMPOP. And a full-scale model of Melbourne’s futuristic train will be in technicolour at Birrarung Marr. “For the first time, we've built a full 3D model of the Royal Exhibition Building’s façade. We will be able to take the REB to another level as a result – I can’t wait to see it,” says White Night Artistic Director David Atkins. Neither can we. For those who like their White Night with a side of gold-panning, Ballarat is getting back in on the action this year. The Town Hall and Craigs Hotel will be projection central, but there’ll also be ‘Ballarat From Above’—an epic, city-wide light show built from Skyline drone imaging. There's also gonna be bush-themed exhibitions, with works like the Ghosts of Eureka street art, Dreamscape, Techtonic Grounds, Blink and Post-Colonial Women in the Landscape. You know the drill by now. Plan your attack, drink lots of water, and if you want to avoid the worst of the crowds, set your alarm for 3am. Get all the 2018 Melbourne White Night details here and the Ballarat lowdown here. Holy crap, guys—GOT just dropped its s8 release date. Winter isn't the only thing that's coming.